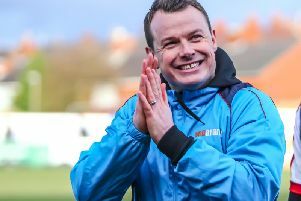 Chorley delighted their supporters in a fine crowd of 1,474 with a commanding performance which delivered their 20th win of the campaign and took them back to the top of National League North. An early goal by Josh Wilson set them on their way and, though Kidderminster looked dangerous at times going forward in the first half, the visitors’ defensive ‘frailty’, as pinpointed by manager Mark Yates afterwards, cost them dear. Two goals in six minutes midway through the second half wrapped up the points, Yates lamenting that ‘heads dropped’ in the Harriers’ ranks when the second goal went in. The Magpies in contrast played with tremendous purpose for as long as it took to secure the win, after which proceedings drifted to their inevitable conclusion. "It was a great performance today,’ enthused Jamie Vermiglio. "We are at our best when we play with intensity and we achieved that here. Our decision-making was as good as it ever has been and our second and third goals were simply fantastic." In a fast start by the hosts, they went one up after three minutes. Adam Blakeman launched a superbly-weighted ball over the top of the Harriers’ defence which Josh Wilson ran onto and steadied himself before calmly shooting past Brandon Hall. Home keeper Matt Urwin pulled off two fine saves but his opposite number Hall was the busier. Scott Leather was unlucky with two successive attempts, the first header smartly saved, the follow-up cleared off the line. Harriers briefly hinted at a revival after the interval – Urwin quickly off his line to close down Harriers’ leading hitman Joe Ironside - but they were undone by a brilliantly-worked second Chorley goal on the hour. Alex Newby deftly flicked the ball on to Marcus Carver who raced away down the right and teed up Wilson to stroke home his second of the game and his fourteenth of the season. Six minutes later the hard-working Carver deservedly made it three, fastening onto another great forward ball from Blakeman and crashing a shot in-off the bar, the linesman confirming the ball had crossed the line. There was no way back for the visitors after that as Chorley comfortably completed their sixth league double of the season and now lead Stockport County (beaten at Brackley) by one point. CHORLEY : Urwin, Challoner, Blakeman, Teague, Leather (Hooper,79), Meppen-Walter, A. Newby, Cottrell, Carver (Anson,79), Wilson (McGurk,70), E. Newby. Unused subs. Almond, Jordan.